Campobello to Deer Island Ferry ramp at low tide. We arrived at the commercial ferry an hour early to find this waiting for us. It actually was wider than it looked, Charlie measured it with his feet and declared it wide enough for the camper to travel on. In addition to looking awfully narrow, it was slippery and had green algae growing on the lower part of it. But, we were first in line! 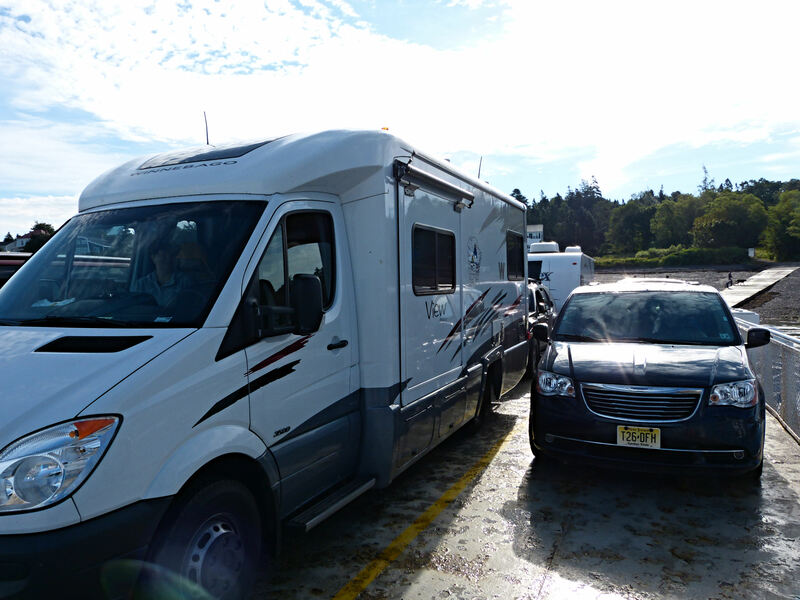 The ferry arrived exactly at 9:00 a.m. and Charlie confidently drove the camper onto the boat. Several other cars followed. I was grateful that I was not responsible for driving the camper down that slippery ramp! I have to say that the ferry was extremely efficient and the two gals directing traffic and managing the ferry were helpful, friendly and efficient as well. After a quick and scenic boat ride, we drove across Deer Island and boarded a larger, government run ferry. This one went around several of the Fundy islands and delivered us to Letete, New Brunswick in no more than 20 minutes. These two ferry rides saved us a total of 100 miles of driving and cost 52.00 for the commercial one, while the second was free public transportation, courtesy of New Brunswick. Camper perched on the ferry. 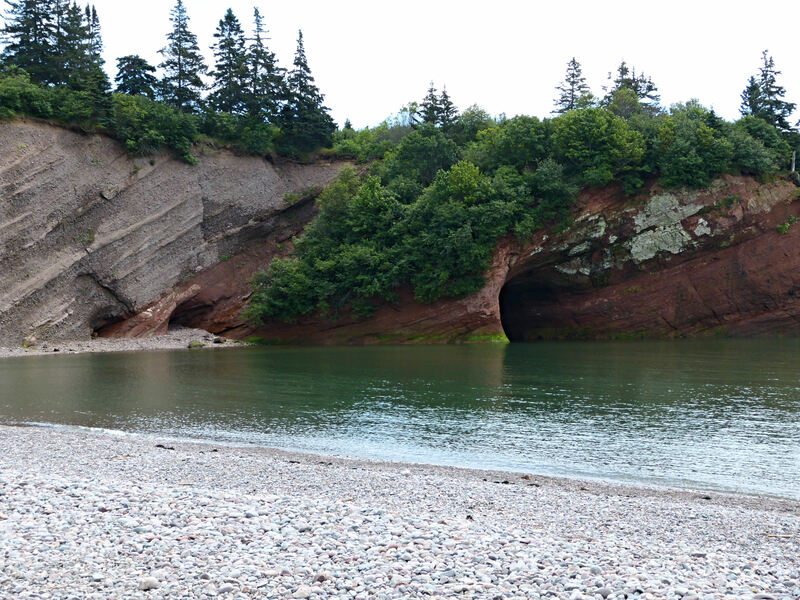 After reaching the mainland, we drove the scenic Fundy highway and spent time at the sea caves in St. Martin’s. 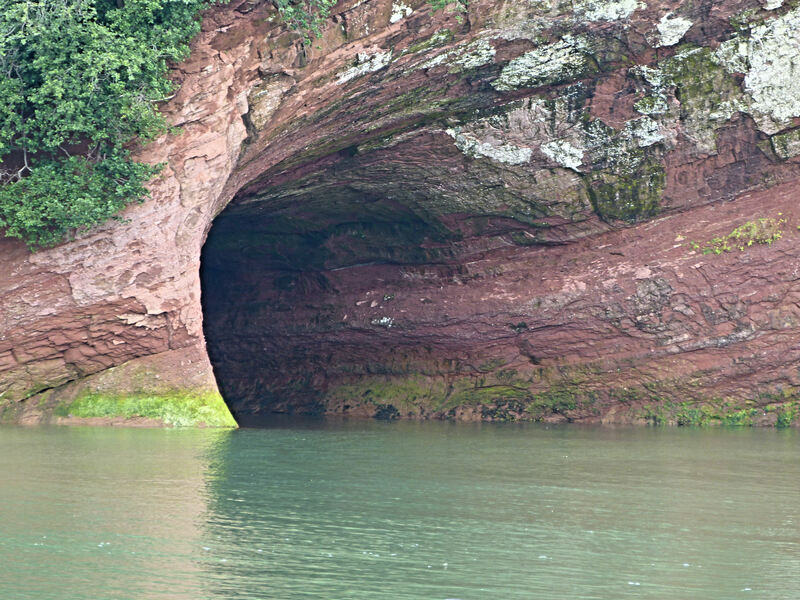 The caves were every bit as impressive as I had expected, and the tide was midway when we passed through. We drove to Fundy National Park and camped at Chignecto North Campground in the park. The campsite was wooded and fairly private, with electricity and water hookups. We will be camped here for 3 nights before heading to Nova Scotia. I’ve learned some new information for your post today. We have been taking the same route to NL for years. Must check out your routes for something different! But Pam, you know what you are doing. Charlie and I are sort of meandering our way to Nfdl. Campobello was a neat place to visit, though. Real nice people. Every day of your adventure sounds and looks idyllic! Looking forward to each one!!! Photos are amazing too! Thanks, Liz. We are just meandering around having a good ol’ time! Wow! That ramp looked just as scary as you described it! I think I would have turned around ifI saw green slime!!! Love your posts! I haven’t been up that far north in awhile, but you are tempting me to start planning for next summer. 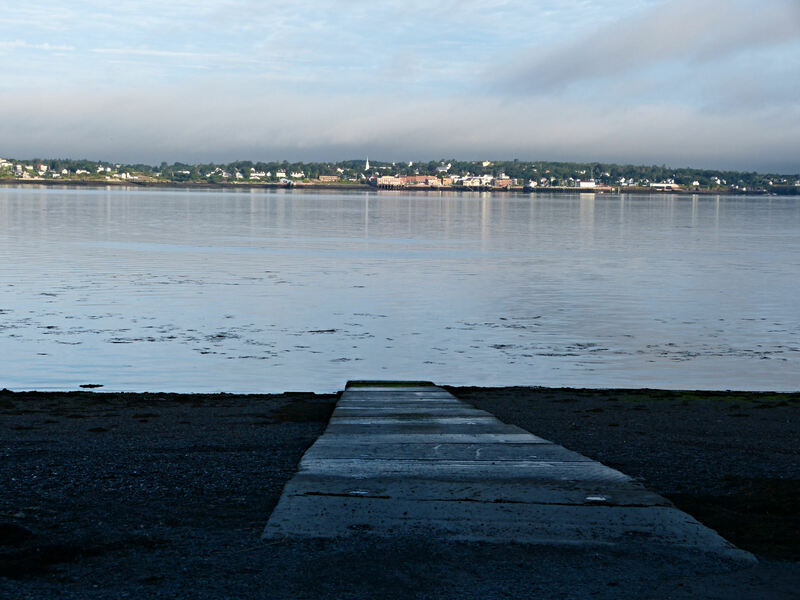 I loved Campobello — felt like stepping back into time. I loved listening to the Roosevelt recordings they play as you go through the rooms of the house. Enjoy the rest of your trip — can’t wait to see where you are headed next!